that will Appeal to Buyers in a Variety of Niches! Good health is always a hot topic, and nutrition is paramount to good health. If you live and breathe, it's something that concerns you and everyone on your list every day. Norma Esler from HomeFreePLR has put together a PLR package that can appeal to dozens of niches - especially at this time of year when buyers tend to be focused on health and wellness. ONLY $17 for Your Buyers! One on each of ten different vitamins. This colorful graphic is designed to be printable, so users can post it on the fridge to ensure they are eating vitamin-rich foods every day. Comes with a thumbnail to display in your sidebar. At ONLY $17... your buyers will want to take advantage of this great deal! Grab Your Affiliate Link Here! ONLY $29 for Your Buyers! Compiled from the articles. Your buyers can brand it and sell as their own! Make it easier for your buyers to make money selling the report. A clean, attractive WordPress theme that you can use on your website. From the Articles – Just copy and paste our text files into your WordPress post editor. Everything is done for you, including 3 shareable graphics per post and our made-to-order video (as mentioned above) for each of the ten articles. The work of formatting is easily worth ten times the price of this whole bundle! ONLY $10 for Your Buyers! Delivered as a txt file. Make it easier for your buyers to make money selling the report. Who needs Vitamin ABC's PLR? Subject: New PLR Release - Vitamin ABCs - Great for all sorts of niche websites! This is the time of year when many people decide to do something positive to improve their health. In fact, good health is always a hot topic, and nutrition is paramount to good health. Vitamin ABC's will provide your readers with the information they need to get off the discouragement treadmill and on the road to a better life. 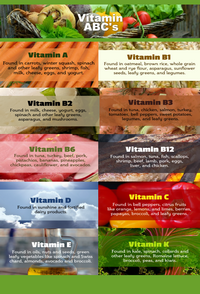 Understanding how vitamins affect their health could be just the breakthrough that they're looking for! ***10 Made-to-Order Videos – as links that you can feature on your blog. Google loves video, so these links will help you get noticed. ***Printable Infographic for Opt-In – This colorful graphic is designed to be printable, so users can post it on the fridge to ensure they are eating vitamin-rich foods every day. Comes with a thumbnail to display in your sidebar. But that's not all! Take advantage of the super low priced one time offer! ***24 page Special Report compiled from the articles. Brand and sell as your own! 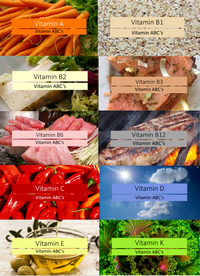 ***20 Additional Graphics – featuring the best food sources of each vitamin and how to get a fast easy serving of each vitamin. ***10 Preformatted Blog Posts from the Articles – Just copy and paste our text files to your WordPress post editor. Everything is done for you, including 3 shareable graphics per post and our made-to-order video (as mentioned above) for each of the ten articles. The work of formatting is easily worth ten times the price of this whole bundle! Take advantage of the Special Introductory Price today!